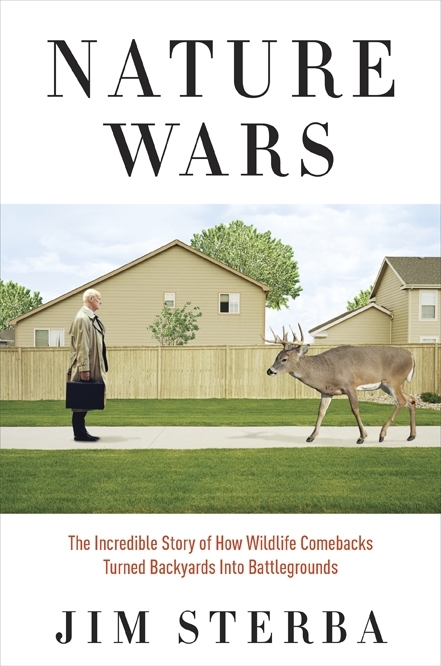 Jim Sterba’s new book Nature Wars: The Incredible Story of How Wildlife Comebacks Turned Backyards into Battlegrounds just hit the streets a few weeks ago. But for years, wildlife has been hitting the streets of suburbia—and quite often becoming roadkill that’s smeared all over those streets. As America’s suburbs sprawled, we created a whole new type of habitat featuring everything critters could want—food, shelter, safety from both two-legged and four-legged predators, and plenty of welcoming humans. Eventually, however, the welcome wore thin. In Nature Wars, Sterba tells his story in three parts. The first, “Forest People,” offers a brief ecological history lesson—reminding us, for example, that most of the landscapes we view as natural are far less pristine than we imagine them to be. This section gets its title from another key idea, that much of the U.S. is now more heavily forested than it’s been for centuries. Surprisingly, that’s especially so for our sprawling suburbs. Truly, we are people of the forest. The second part of the book, “Wild Beasts,” traces the stories of five invaders that have joined us in our suburban forests: beavers, deer, geese, wild turkeys, and bears. (Yes, we’ve invaded their habitat. But quite often they’ve also invaded ours, sometimes in areas where they hadn’t existed for centuries, if ever.) The book’s third section, “Denatured Life,” touches on a few more topics while exploring the broader idea of what all this reveals about us and our shifting relationship to the natural world. Many of us, however, do love birds. In fact, the #1 way—and quite often the only way—that most Americans relate to wildlife is by feeding birds. Although we rarely give this activity a second thought, Sterba devotes entire chapter to it. I found it one of the most eye-opening in the whole book. In DEERLAND, I give readers an insider’s tour of America’s deer-industrial complex, making a strong case that yes, there really is such a thing. But until I read Nature Wars, I had no idea that there’s also a “bird-feeding industrial complex.” It used to be that calling something “chicken feed” meant it involved a very small amount of money. Not anymore. Sterba notes that by 2006, 56 million Americans were feeding wild birds—more than the 30 million who fish and the 12 million who hunt combined. They were spending 3.5 billion annually on bird seed, and another $801 million a year on feeders, nest boxes, birdbaths, and other equipment. To prevent feeding from being regulated, and to make sure their products weren’t subject to special taxes that would fund wildlife conservation and habitat preservation (taxes similar to those the hunting and fishing industries actually asked to pay), the industry formed a trade group called the Wild Bird Feeding Institute (WBFI). Apparently its lobbyists have been quite successful in pressuring state and federal wildlife agencies to keep their hands off the bird-feeding business. Sterba is a realist, and he doesn’t see us making much progress toward regaining control of our relationship with suburban wildlife. The one exception might be our new willingness to manage overabundant suburban geese, even when “manage” means “kill, butcher, and donate to food pantries.” Sterba believes the turning point came on January 15, 2009. That’s when US Airways Flight 1549 sucked geese into both its engines and ended up landing in the Hudson River. If Captain Chesley B. (“Sully”) Sullenberger was the hero that day, geese were definitely the villains. I learned a lot from Nature Wars. I found it a thought-provoking read, and I enjoyed it immensely. And in case you’re wondering… I have to admit that when I first learned of Sterba’s new book, I felt a moment of panic—especially when I saw the hilarious image on its cover. How much overlap would I find with my own book DEERLAND, which won’t be released until April 2? But once I began reading Nature Wars, I quickly realized that I needn’t have worried. Nature Wars does include a chapter about deer, and Sterba mentions them occasionally in other chapters. In DEERLAND, which is obviously about just that one particular animal, I include a chapter on deer in the suburbs. (Its title is “Invasion of the Suburban Cervids,” which seemed ominous enough, but without sounding quite as sinister as, say, “Night of the Living Deer.”) I also mention suburban deer issues in a few other chapters. It turns out, however, that we’ve approached the question of overabundant suburban deer from different directions and explored it in different ways. So I’d say the two books are nicely complementary. If you’re interested in nature and the environment (or, for that matter, deer), then Nature Wars is a book you shouldn’t miss. While I’ll soon be asking you to buy my own book, I suggest you click here and buy Nature Wars right now. They are always detailing how many birdwatchers and how much they spend etc. The largest user group. Yes, those stats are interesting. Individual anglers and hunters might spend more money on the outdoors, but their numbers are actually smaller. So glad you’re aware of that! I believe the time is now for “viewers” to have just as much voice or more in environmental, wildlife and conservation issues. I believe that Fish and Wildlife and state wildlife agencies aren’t quite prepared to allow US into the equation. Yet. Gail, viewers do have just as much voice as anyone else in that they elect the state legislatures that appoint and even many times direct the state fish and wildlife commissions. Digging down into the statistics a little shows that most “viewers” participate at their own houses, ie bird feeders. There is actually a wild bird seed organisation whose sole purpose is to appose any sort of minimal tax on wild bird seed to help fund fish and wildlife. For now, there are more hunters than there are away from home viewers, and combined with the shooting sports people and anglers, they pay almost all moneys for managing wildlife, protecting habitat, etc. Not everyone makes fun of roadkill and many people *do* notice. I’ve also noticed, for example, a huge decrease in dead roadside robins. Have you? There used to be one every stone’s throw, but much fewer in numbers these past 4 or 5 years. I don’t know if that’s due to a decrease in the overall robin population or that they are evolving into being more aware of vehicular dangers. The review was great…sounds interesting, as does your upcoming book. May I also recommend EXPOSING THE BIG GAME by Jim Robertson? Definitely worth reading, with superior photography. Gail– Thanks for stopping by! Please forgive me; somehow I didn’t get an e-mail alert about comments. I haven’t noticed a reduction in roadkill birds. Hate to say this, but could there just be fox, crows, raccoons, or some other scavengers that are more numerous in your neighborhood? And I’m not familiar with that book. I’ll have to check it out.